“Serena Perrone: Reverie” is an exercise in patience and meticulous viewing with the promise of rich rewards. The exhibition spans the artist’s studio practice, beginning in roughly 2005-6 and continuing all the way up to 2012. Each work on display is an utterly enthralling experience. On the surface the exhibit seems to be clearly divided between the larger, densely rendered, monochromatic storytelling-style works that greet you as you enter, and the smaller, spare, sketch-like colorful Asian-style landscape works that bring up the rear. However, after I spoke with the artist (interview located here), I resolved to put on my “motif-hunting cap” and to dig in and study how these carefully curated works coalesce and connect, either visually or thematically, with one another. Maintaing a Safe Distance and Living to Tell. Detail. 2012. Courtesy of Serena Perrone. 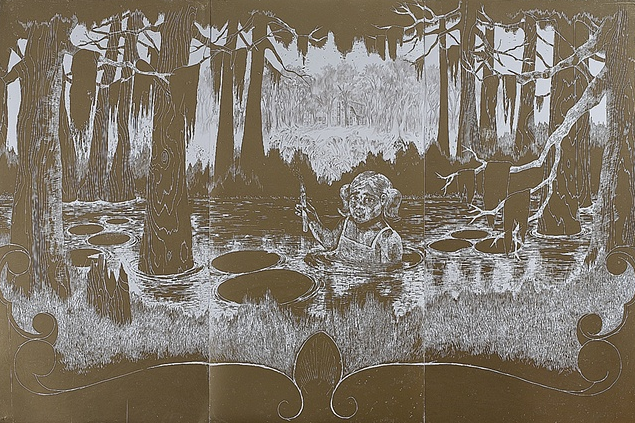 As I walked throughout the gallery, analyzing each image, I noticed that the larger pictorial woodcuts adorning the walls of the first room have an eerie air of a Grimm Brothers fairy tale, with their motifs of innocent-looking young children enveloped in surreal landscapes populated with dense thickets, bodies of water, and other natural settings. There is a strong contrast of light and dark in these works, with condensed patterns of line and design in the foregrounds of the works dialoguing with the faintly articulated trees in the background and center of the works. In particular, "The Origin of Self-Sacrifice (IV)", dating from 2006-7, with its mournful-looking protagonist entrenched in a swampy body of water, serves as a haunting highlight. These works ultimately produce a strong feeling of unease. Who are these children, with their mournful expressions and wary eyes, and why are they in these fantastical landscapes? What are their stories? Given the show’s title, “Reverie”, are we seeing the frightened dream landscapes that ensnare these children like the dense flora that envelops them? The compositions certainly are related in their visual language: the foreground action serves as a sort of picture frame within the print to draw the viewer in, back towards the more hazily rendered center, but for what purpose? Knowing that each work has been considered and labored over for a long time makes me wonder how the final products on display differ from their original ideas and iterations. The Origin of Self-Sacrifice (IV). 2006-7. Courtesy of Serena Perrone. The back of the room is an entirely different experience which, upon deeper consideration, betrays the viewer’s sense of ease. 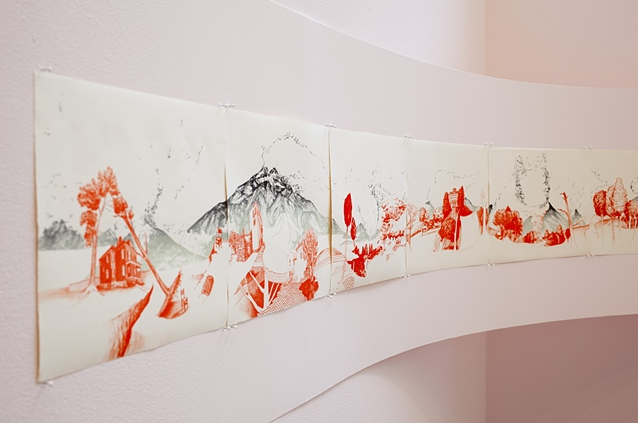 The room is stocked largely with narrow, simply rendered, gracefully delineated images, in mixed media or in silkscreen, of Asian-style mountainous volcanic landscapes using a limited palette. Rather than fill the paper with thickly rendered flora and human fauna, Perrone in these works has chosen to leave much of each page white and unadorned. In the vitrines are wistful Japanese-inspired volcanoes gently billowing smoke, while as if projecting from a corner is one long continuous landscape (titled "Maintaining a Safe Distance and Living to Tell") in dark blue with red-orange man-made elements interspersed throughout. Hung salon-style on one wall is a series of prints combining a theatrical trompe l’oeil frame with a faint landscape in the center. While the works in the earlier room reserve much of their action for the foreground and leave more open space towards the center, the majority of the works in this room take the opposite tack, enveloping their subjects in white blank space. As I consider the differences in treatment of both kinds of landscapes, I can’t help but notice that their juxtaposition adds another layer of meaning to these seemingly opposed methods. While the landscapes in the first room featuring children have an element of fear and the gothic fairytale about them, the landscapes in the second room lack any traces of negativity; these simply colored, un-busy works revel in their apparent serenity and quietude. What is Perrone saying about our dream worlds? Is she comparing the dreams of children, who fear the dark, the monsters under their bed, that which they don’t quite understand, with the dreams of adults, who often dream of nothing more than some peace and quiet? Perhaps, as indicated in a small segment of "Maintaining a Safe Distance" that features a small tree house, adults dream of a return to the perceived innocence of childhood? Yet upon returning to the works in the first room, we are quickly reminded that it is not quite so simple. Childhood is not so innocent; not even childhood is free from pain. Likewise, another look at the seemingly peaceful landscapes of the second room reveal that not even these works are free from strife; in "Maintaining a Safe Distance", that work with the scope of an epic poem, the smoke from the volcanoes threatens to drown out the human presence. In this regard, it’s quite interesting for me to juxtapose these bodies of work that were not designed in tandem, and to see what they reveal about each other when displayed together. As Perrone returned to modify each image again and again over a period of time, surely her view of the passage of time from childhood to adulthood changed and informed the way the viewer interprets these images. Are we always doomed to turn to our dreams to seek relief, and are we meant to be disappointed by their contents? “Serena Perrone: Reverie” kicks off what is sure to be a fantastic year of art for the List Gallery. The List Gallery is open Tuesday-Sunday from 12:00pm-5:00pm. This exhibition runs until October 27th. These works seem to inspire lots of thought...they sound wonderful! Nice review! Origin of Self-Sacrifice is really striking. There's something sort of Hansel and Gretel about it, if that makes sense.